If you haven't made steamed artichokes in forever (because how often do we really get to make those beautiful things? ), now is the time to break out your steamer and try this magical dipping sauce! With its sweet, salty, garlicky, and tangy flavors, it's a wonderful accompaniment to a pile of steamed or baked artichokes. We dare say you won't be able to to stop dipping! It's super easy to whip together in a simple bowl or food processor, and although it feels indulgent, it's mostly made out of fat-free greek yogurt, so it's fairly low-calorie and insanely delicious. We recommend breaking out this recipe for a dinner party or during the weekend for a change in pace. Your guests may be surprised at just how much they like it. Just cook those artichokes in an instant pot, oven, or a stove-top steamer. Serve them with a little extra lemon juice and a generous helping of the dipping sauce, and you're wet! 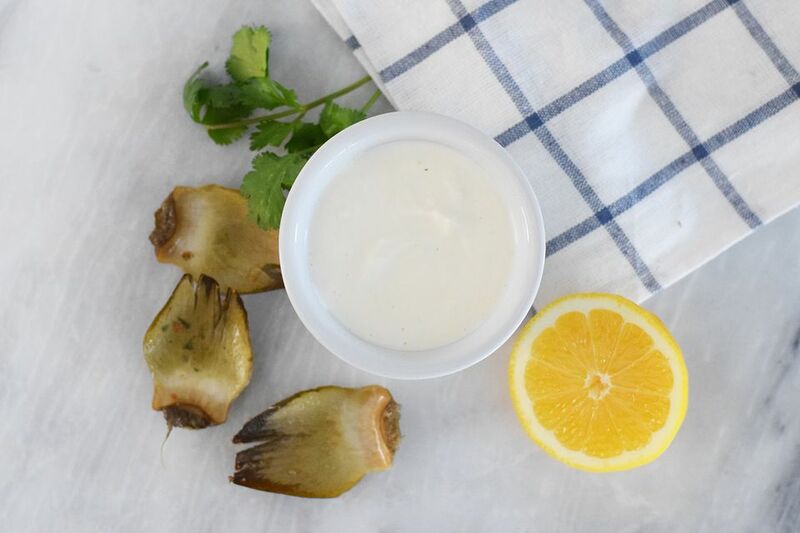 Don't have artichokes, but still want to test out this delectable dipping sauce? You're in luck, as this sauce is also amazing on many vegetables! Pair it up with steamed carrots, green beans, or broccoli and you'll be set for dinner. It's such a versatile dip that you can even serve it with crispy french fries, steaks, and burgers! If you're making this for a crowd, you can easily double the recipe and keep it in the refrigerator for all your dipping pleasure. If you are making it for fewer people, just halve all of the ingredients. If you want to tap into your host(ess) side, just serve this dip in individual bowls alongside your cooked artichokes or veggies. Place the fat-free greek yogurt and mayonnaise into a medium-sized bowl and whisk until they are completely combined. If you have a microplane, use it to grate the garlic into the greek yogurt mixture. If you don't have a microplane, finely mince the garlic or use a garlic press. Add the black pepper, salt, mustard, and sugar, then continue to whisk until mixed together thoroughly. Squeeze in about 2 tablespoons of lemon juice, whisk some more and then add more lemon juice to taste. Serve in small individual bowls! If you have a food processor, you can add all of the ingredients to it - this will chop up the garlic for you without any work - and adjust the seasoning to taste.